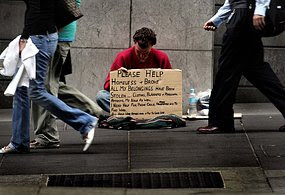 Queensland senior vice-president Brian Moore says middle income earners are joining the ranks of the homeless due to higher living costs. The Society has warned that the demand for help is so high, it may have to stop providing rent assistance altogether, because costs will increase by more than $250,000 this financial year. Mr Moore says the problem is close to spiralling out of control. "There's a lot of people homeless out there and a lot of people are hurting and it's just getting worse," he said. "The fact is that Australia is facing an avalanche of homelessness, there's no doubt about that."